In 2009, longer distances were definitely better. Then things looked kind of mixed in 2010 (generally an off year), before returning to normal in 2011. So far this season, this look fairly mixed again, although with only a single race over 10k. Things look the same for 2009: noticeably better at the longer distances. 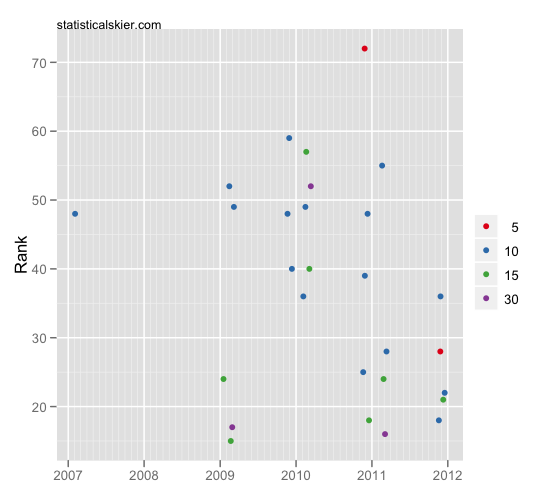 Now, though, 2010 doesn’t look “mixed”. Rather, it seems she skied quite a bit better that year in the 10k’s (again, having a generally off year). But then both 2011 and 2012 look fairly mixed to me, with some good races at several different distances. So I think her results have displayed a modest tendency to be stronger in longer distances, but not quite as much as you might think by looking only at her finishing place. Posted by Joran on Friday, December 30, 2011, at 6:00 am. Filed under Analysis, Cross Country. 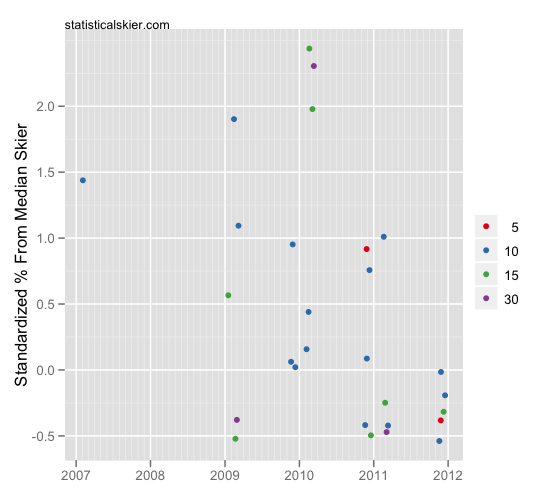 Tagged Analysis, Distance, liz stephen, women, World Cup. Follow any responses to this post with its comments RSS feed. You can post a comment or trackback from your blog.